The following links will let you download materials like Sketchup Models or spreadsheets that I used in class to illustrate a point or for an interactive exercises. I will also post any materials we develop or reference during the class each day after class. So far, we have not used these models but if you are curious about how coils are built or how a water coil might differ from a distributing tube steam coil, then you may find them helpful since you can electronically take the coils apart by turning layers on and off. There are also models from a case study of an air handling system with very poor discharge conditions that contrast as designed with as installed conditions along with perfection and the best possible field solution. I have also not used these yet but the topic may still come up. Usually, when we have more time, I use these models as an example of something a control system can not fix directly. But, by optimizing things like the schedule and the air side flow profile (the system was a VAV system) it is possible for the control system to minimize the impact of the poor discharge conditions. There is information on the SketchUp page of this website about how to get a copy of the free version of SketchUp. All of the models have been back-saved to SketchUp version 8 in case you already have an older version of SketchUp on your computer. If you have a newer version, the files will also open in any version of SketchUp from version 8 forward. This zip file contains all of the spreadsheets and system diagram I used during out discussion. 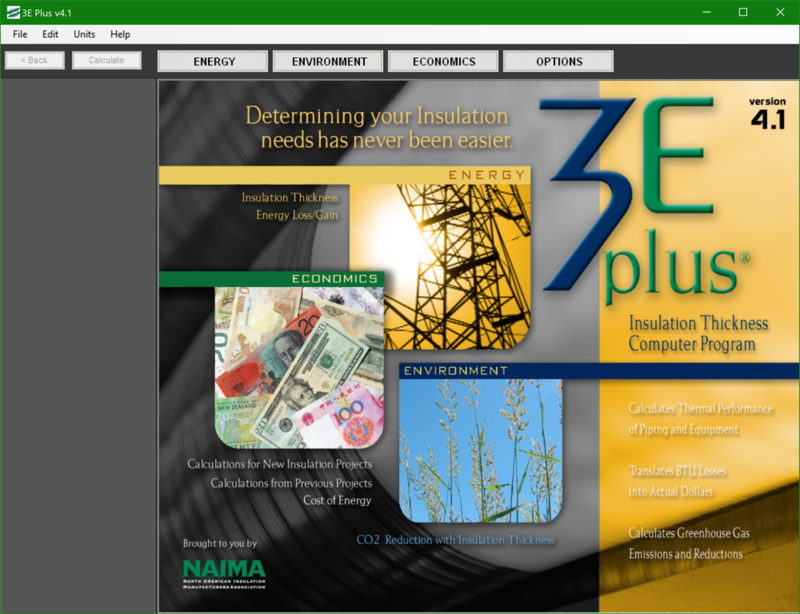 The software tool that I used to estimate heat loss from a pipe was 3EPlus, which is a free download from the NAIMA website. The zip file below contains the follow-up materials I said I would provide during lecture on Wednesday. 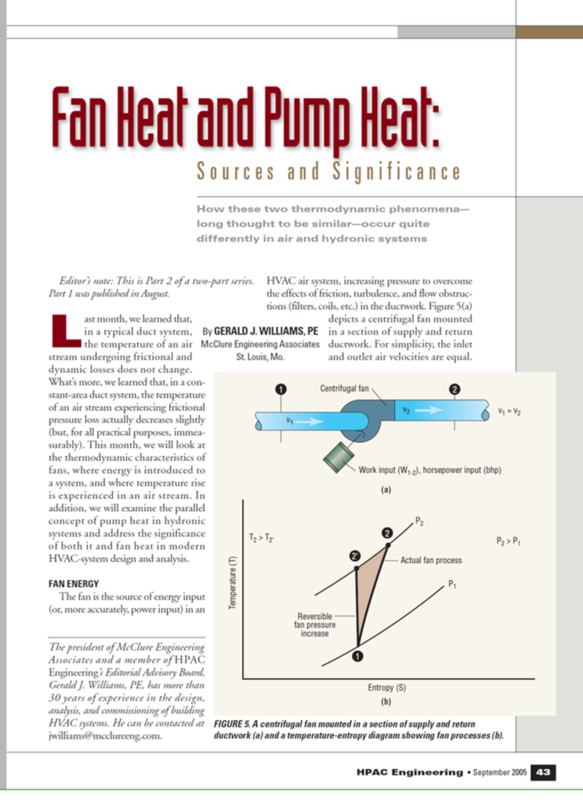 It includes the two articles that Jerry Williams wrote for Heating, Piping, and Air Conditioning magazine about fan heat and the spreadsheet I used to calculate the source energy required to charge an iPhone. If you want to know a bit more about site vs. source energy and be linked up with some resources that will give you access to conversion factors, you may find the blog post I did titled Site vs. Source Energy to be of interest. The links and zip file below will connect you with the follow up materials I mentioned that I would provide during class on Thursday. 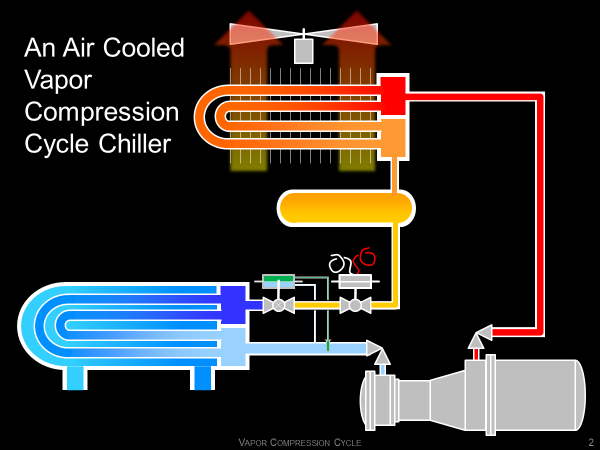 You will always find the most current version of the chiller plant along with the site it is located on and the ballroom air handling unit it serves on the ​Chilled Water Plant System Diagram Exercise page of the website since they are the models behind that exercise. I have put anything yet on the website that uses the Heat Recovery Unit model or the Le Conte Annex AHU model, but you will find the HRU model in the materials I provided as a follow up for the Monday session of the class above. The Le Conte Annex AHU model is included in the zip file below. You will always find the current version of the logic diagram tool on the Logic Diagram Tool page of the website. I am currently making some "tweaks" to the tool; nothing that changes how it functions, just some details behind the symbols and a few new symbols. So you may want to check back occasionally to see if there is a new version available. You can tell what has been added and when by visiting the What's New page of the website. I will also plan to occasionally upload examples of logic diagrams for different control sequences that will include the point list and the narrative description of the sequence. For instance, I am currently working on the logic that would be used to control the cooling towers and bypass valve in the Davis Hall chilled water plant that we discussed in class. The Davis Hall SketchUp model and system diagram are included in the zip file below. You can also see other examples of logic diagrams and control system specifications by links provided on the Control and Logic Diagram Standards page of the website. The load profile example that I showed was actually something I focused on in a training class I did several weeks ago for the National Conference on Building Commissioning (NCBC). So, rather than re-invent the wheel, I am going to suggest that you just visit the NCBC 2017 class materials webpage to pull back the spreadsheets if you are interested in them. Since the class was a workshop that focused on variable flow chilled water plants, you may find some of the other resources there to be of interest. The sample documents from a recent project were we provided third party control system design services. 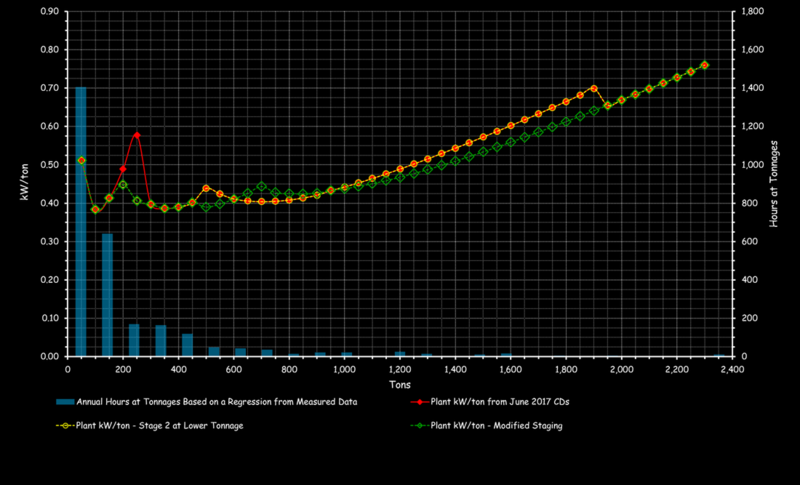 The spreadsheets with the chiller and cooling tower performance data for the equipment in the chilled water plant model that illustrate the kW per ton curves and the break even points for running the towers harder to deliver better kW per ton performance from the chiller compressors. ​Steve Taylor's ASHRAE journal article on why enthalpy controlled economizers tend to fail and how to come up with an appropriate outdoor air dry bulb temperature limit set point for your system and climate. You will also find an example of the technique in the Functional Testing Guide in the chapter on economizers and mixed air. The models and materials I used today for this class are identical to the materials I used for the class last month at NAVFAC SW. So if you want them, just download the files from NAVFAC SW for Monday, October 23. Depending on where are discussions take us today, there may be some materials that I use during lecture that are not in the downloads from NAVFAC SW. If that is the case, I will post a follow-up folder here this evening or tomorrow morning with that information in it. The file below contains information I said I would provide during lecture on Monday, Tuesday, and Wednesday. It includes a "Read Me" file describing what the other files are. After a bit of a delay, I have finally pulled together the stuff I said I would provide in during lecture on Thursday. The zip file below includes a 'Read Me" file describing what the other files are. These are the presentation files we are using in the class. The materials that follow are additional information that was used in class to illustrate a point, the models we used for some of the exercises, tools that we used, spreadsheets that were shown, etc. These are some models of coils and of an air handling system that had very poor system effect that complement some of the supplemental information that is provided on the equipment we are controlling; i.e. the controlled system. If there are follow-up items that come up in class today, I will also add a folder here with that information in it after class. These are the files I will reference and use to support the exercise we will do where we think through a very basic control process and how you start to define the elements of the process (the inputs, outputs, set points, and the process itself) by taking the characteristics of the equipment you are controlling into consideration. If there is follow up material from our discussion, I will also post that in a follow-up folder here after class. These files are the models and materials we used in class on Wednesday to supplement the slide sets. Note that because our timing shifted a bit, some of them were actually used on Thursday, but I had them grouped with the Wednesday information so I just uploaded them that way. The supplemental information file includes a Read Me file that describes what the different folders and files contain. Several people had questions about Trane's Control system programming and I had some sets of manuals on a hard drive that include hardware information and programming information. So I have also included copies of them in one of the zip files. The zip file to the right contains the follow-up information from the class on Thursday. It also includes a Read Me file to explain what the other files are. This portion of the web page is dedicated to the NAVFAC Pacific DDC Controls class. The presentation files are the basic slide sets we will be using for the class and you may want to download them ahead of time. We also use a variety of other materials like Sketchup Models and spreadsheet tools in the course of presenting the class. Since we typically, we adjust this basic content to the nature of the students and their location, the supplemental information will vary from location to location. As a result, we wait until the day before a given class session to post the supplemental information. As a starting point for the NAVFAC Pacific class, we are posting the supplemental information we believe it is the most likely that we will use on Monday. So you may also want to download that information ahead of time. Finally, in the course of answering questions, we often will reference a resource. When we do that, if it is something that can be distributed electronically, we will post it in a follow-up folder for the day. We have been using SketchUp models of mechanical equipment and mechanical equipment rooms as a teaching aid for a number of years now. The zip file to the left below the image contains a number of models that we typically use through-out the course of the class. We will probably be using one or more of them on Monday. And, while you will be fine simply following along as we project them, without having them on your laptop, some people prefer to have them available during class. SketchUp is a powerful, 3D modeling tool. If you are not familiar with it and/or are interested in putting it on your laptop so you can work with the models directly, you will find information including downloads and links to tutorials on our SketchUp Models page. The file below contains the follow up materials from Monday's class. There are two files in it. One is a .pdf of the actual file David presented (I made changes over the weekend when I realized nobody probably had economizers and heating systems and then forgot to post it). The other is a file Steve will be using today instead of the presentation on LON that was included in the original presentation materials for Tuesday. The zip file below contains the follow up information from the Wednesday session. There is a README file that tells you a bit about what each of the files in the folder is. The zip file below contains the follow up information from the Thursday session. There is a README file that tells you a bit about what each of the files in the follow-up folder is. The two Marine Corps Base Hawaii files are the drawings and specs Jay mentioned at the end of the class. This portion of the web page is dedicated to the NAVFAC NW DDC Controls class. The presentation files are the basic slide sets we will be using for the class and you may want to download them ahead of time. We also use a variety of other materials like SketchUp models and spreadsheet tools in the course of presenting the class. Since we typically, we adjust this basic content to the nature of the students and their location, the supplemental information will vary from location to location. As a result, we wait until the day before a given class session to post the supplemental information. For this class, we anticipate that there will not be supplementary information for Monday, but there will be for Tuesday and Wednesday. So, you may want to check back right before class on those days to see if there is anything you want to download for . .
​Finally, in the course of answering questions, we often will reference a resource. When we do that, if it is something that can be distributed electronically, we will post it in a follow-up folder for the day. The zip files below contain the resources and information we shared in class that was above and beyond the PowerPoint slide presentations. Each zip file contains Read Me files for the folders that describe what the files contained in the folder are.